Review copy sent to me by the publisher for the Cybils. Content: Aside from the creepy person kidnapping orphans (but it’s really not that scary), there isn’t anything untoward in this book. It would happily sit in the middle grade (3-5th grade) section of the bookstore. Rose lives in St. Bridget’s Home for Abandoned Girls in London, with no idea, really, where she came from or who she is. (She’s named after the rose bush that was blooming the day she was found in a fish basket in the churchyard.) She really doesn’t have much hope of ever being adopted, so she trudges on, one day after another. 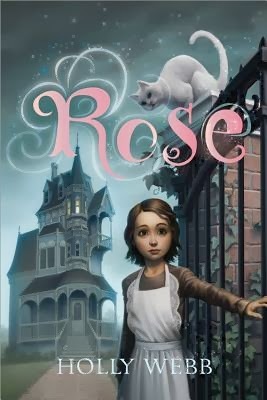 Then one day, a housekeeper for a wealthy alchemist/magician arrives, and Rose ends up as a maid in the house. And she discovers that she has a talent for magic. It turns out, too, that orphan children are disappearing from the London streets. No one is really concerned — they’re orphans, after all — but when a friend of hers from St. Bridget’s goes missing, Rose knows she has to do something. And with the help of the magician’s apprentice, maybe she can. This is, in many ways, a book that’s already been written. Orphan? Check. Plucky lower class girl outsmarting the gentry? Apprentice story? Check. Check. Evil magician stealing children? Check. It should have been by-the-numbers boring. And yet, it wasn’t. Partially because of the writing — Webb does know how to keep the pages turning — but mostly because Rose is such an endearing character. She’s neither snarky nor plucky. She just does what Needs To Be Done. She’s hardworking, but doesn’t have any desire to be Great. She’s not terribly smart — she has no idea how she’s doing what she’s doing — but she is willing to learn. And she is, above all, loyal to those she calls her friends. She is, for all purposes, a Hufflepuff. And that is why I loved her. The story is good, as well. I think this is a first in a series, but it doesn’t need to be. I can see a lot of kids loving it — boys too, if they can get past the title and cover — because it’s quite accessible. Sounds good, though. At least it has a satisfying conclusion! I read this recently and also found it to be a winner. I liked it myself even though it was predictable; she made the characters likable and it isn't above a middle-graders head with extra stuff.